This is made from the curtain that I didn’t end up using the room, deep teal canvas. 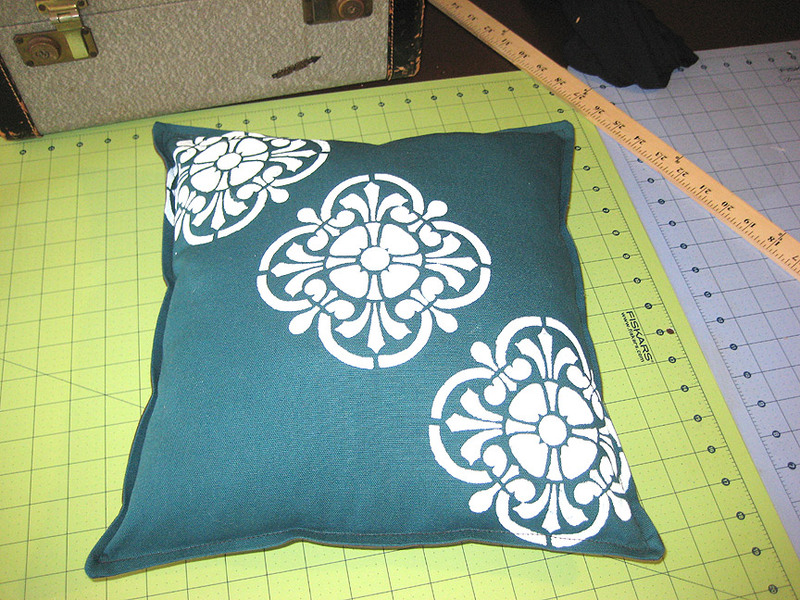 I applied the stencil repeating diagonally with fabric paint. the back is a soft, dark brown stretch twill. 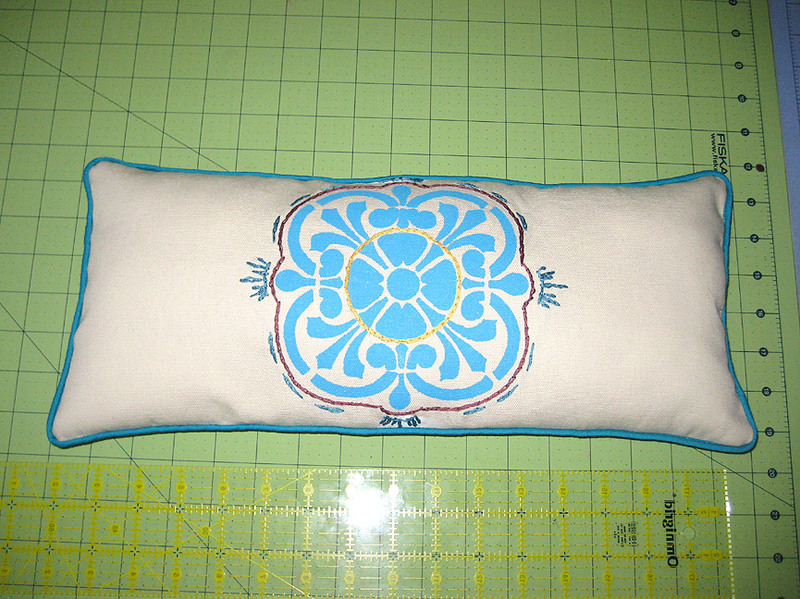 This is made from the piece of cream canvas left over from the curtains I did hang. I painted the stencil on with fabric paint, did a terrible job of masking it, got paint everywhere and hand embroidered some stitches into the design to cover the paint flubs. I wanted yellow or brow piping on this, but I didn’t have either in the house and I’m making an effort to use what I have laying around, rather than buying more stuff. I’m actually really pleased with how the blue looks, though I do think yellow would have been great to highlight the stitching. The back side of this is piece from the sheets currently on the bed so I can pretend it all ties together. And here they are on the bed! YAY! 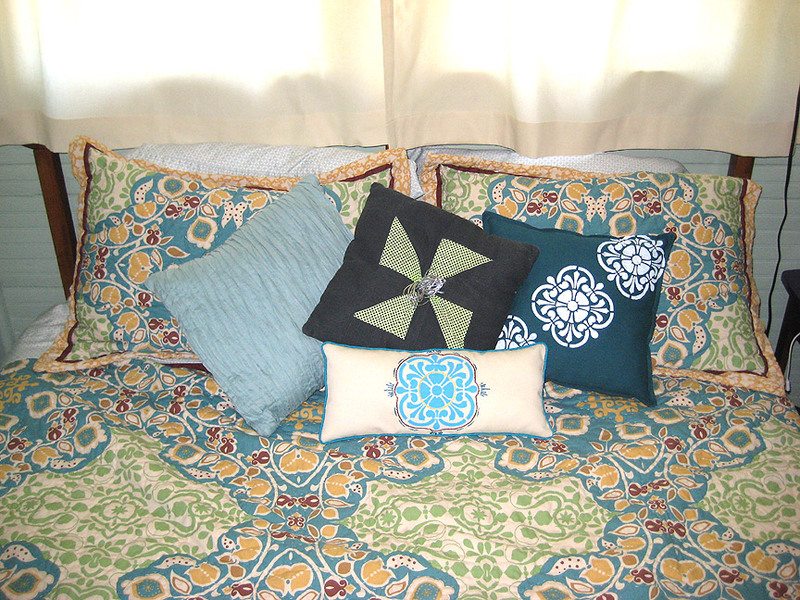 The pinwheel quilted pillow in the middle was made by my friend Michael Frazier, about a decade ago. He has since died, but this pillow always makes me smile and think of him. I think he’d like the pillows I made today too. Hooray for pillows! And for projects finished. Now to get back to the 10,000 other things on my weekend to-do list that still aren’t done. Categories: craftygirl, dreamtime, homestead, pretty as a picture | Permalink.